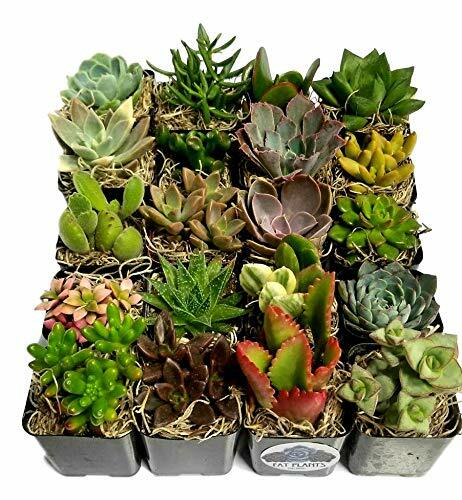 This package contains varieties of fully rooted succulent plants in plastic growers pots. Varieties will vary from season to season and packages will contain a good mixture of color, textures and shapes. Pot size will vary between 2 and 2.25 inches, between round and square and in color. Many succulents will lose some of their color if they are not getting adequate light. Traveling in a box for 2 to 3 days will absolutely fade your new plants however they will regain their brightness with proper care over time. We suggest opening the bottom of your plants gift boxes and slide them out slowly for the least amount of damage when unpacking. Some of the succulents in your package will have a layer of spaghnum or preserved moss over their soil. We do suggest removing this before watering and replanting as it can retain more water than a succulent needs and cause the lower portion of your plant to rot. Quick instruction cards and access to our Cactus and Succulent eBook are included with every order. Varieties in this package may contain aloe, sedum, kalanchoe, echeveria, senecio and more. We rotate over 200 varieties of cactus and succulent plants in all of our variety packages. Fat Plants is a California licensed nursery and grower. If you have any questions about this product by Fat Plants San Diego, contact us by completing and submitting the form below. If you are looking for a specif part number, please include it with your message.